The 'Arabian Nights' tale "The Thief of Bagdad" retold and relocated to ancient China. Dracula’s Tomb Discovered in Italy? It takes the love of a princess to steal the heart of a thief. I was in such high hopes of seeing an adaptation of a classic story like the Arabian Nights. Instead i was disappointed in a film that failed to keep my attention from the very beginning, even though i tried watching it twice!! It was a bonus that Caradine was in this movie but it didn't amount to much as the actors lacked likability. For something a little similar Zorro with Anthony Hopkins and Bandaras is much better for action, comic moments and overall enjoyability. 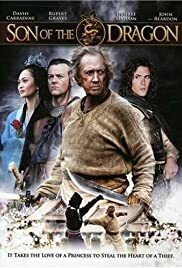 OK, so Son of the Dragon has many possible fans out there, but if your looking for something to wow about in terms of martial arts and plot line you wont get it. If you just want the kids to settle down on a Sunday afternoon then maybe this it for you along with the 3 ninjas.